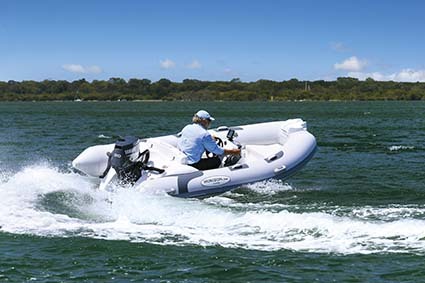 Horizon Motor Yachts is a new player in the inflatable boat market. 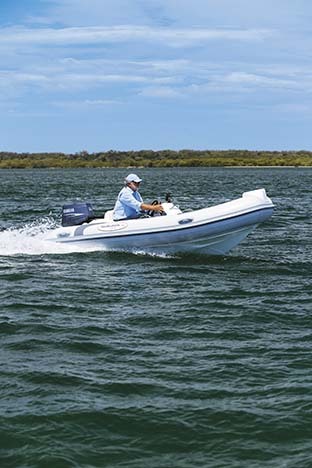 We headed to the Gold Coast to test the new 3.8m RIB and 4.3m RIB. 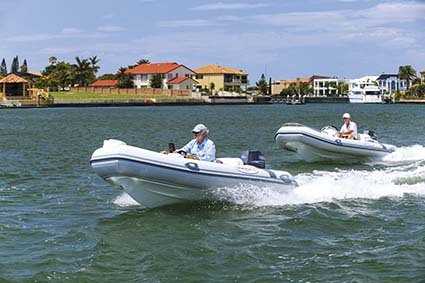 We headed to the Gold Coast to test two of the new Chinese-made Horizon tenders: the 3.8m tender and 4.3m tender. Both boats are rigid inflatables (RIBs), meaning they have a rigid fibreglass hull supported by an inflatable tube for buoyancy and stability. Inflatables make ideal tenders because of their inherent stability underway and also when boarding and alighting. They have advantages over traditional hulls too. For example, their air-inflated sides cause less damage when alongside and have a better carrying capacity for their length. Layout and equipment on the two test boats were similar but the larger boat is 50cm longer and 16cm wider, with a carrying capacity of seven, versus four in the 3.8m model. Both hulls are solid ’glass construction and feature a deep 20˚ deadrise and spray rails along the sides to help keep passengers dry. Neat, modern styling is complemented by gleaming white gelcoat against light grey tubes with the distinctive Horizon logo. Everything is moulded and assembled in China, the tubes built from Hypalon imported from France. This product is used in all quality inflatables for its durability and puncture resistance. It’s even claimed that cared-for Hypalon tubes can last up to 20 years before being replaced and even then the cost is relatively low. Three separate air chambers in the 3.8m and four in the larger boat add a measure of safety in the unlikely event of a tube being punctured. Up front in the 3.8m is a narrow fibreglass fairlead with a stainless steel cleat leading back to the bow seat. Here, a clip-down cushion lifts to reveal a wide, screw-in waterproof hatch. Another seat is located alongside the console that’s offset to starboard and there’s seating for two more at the helm. Both seats lift to access the 60lt fuel tank, battery and dry storage area that can hold all safety equipment and leave room for some personal items. The moulded ’glass console has a stainless steel grabrail conveniently placed on top to assist passengers moving about and instrumentation is kept simple with only a fuel gauge in the dash and a Humminbird 153 black-and-white sounder mounted on top. Power is from a 30hp Yamaha and it had plenty of punch for the lightweight 195kg hull to get two of us on the plane at 10kts and easy cruising at around 17kts across a small chop. At full throttle I saw 25kts on the GPS with the boat tracking true and feeling stable and safe. The fibreglass hull cut through the chop easily and the tubes soaked up any bumps for an incredibly soft ride. Any spray was deflected well away from the boat keeping us dry across the slight breeze. Size sure makes a difference to the 4.3m, which really feels a lot bigger than the extra 50cm shown on the spec sheet. Part of the upsize includes wider tubes and higher carrying capacity. There’s plenty of space for five to spread out on extended jaunts to secluded shores, and the maximum of seven passengers will be okay for short hops but otherwise a bit squeezy. A low stainless steel bowrail encloses a fibreglass bowsprit that can double as a boarding step. Under the front cushion is a large anchor locker with a hinged hatch that has draining channels around the edge to keep the hold dry. In front of the offset console is a fixed seat with a second one alongside that can be removed to create a walkway between bow and stern. The 4.3m’s console has a larger dash panel to accommodate the Yamaha 50’s more comprehensive instrument display of speed, revs, voltage, oil pressure, trim and fuel. You also get a Humminbird 385 combination sounder-GPS set into the dash. 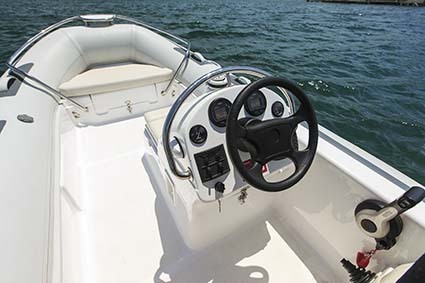 Engine controls are neatly mounted to the side of the boat rather than on the console. They fall to hand naturally and all wires and cables are concealed inside the hull for a clean look. Under the twin helm seat is a useful storage area where the battery is secured in its own box and a 2000lt/h bilge pump is easily accessed. Driving the 4.3m with the extra grunt of the 50hp Yamaha is a load of fun; there’s more pop out of the hole and good acceleration through the rev range. With a bigger footprint on the water it feels even more stable than the 3.8m, especially in turns where the prop had no trouble hanging on – even in tight cornering. A Horizon tender resting in a cradle on the deck of a luxury Horizon motoryacht would make a good match, but they will also find homes on the jetties of commuters or those who like the idea of a simple, safe boat for a day on the water. 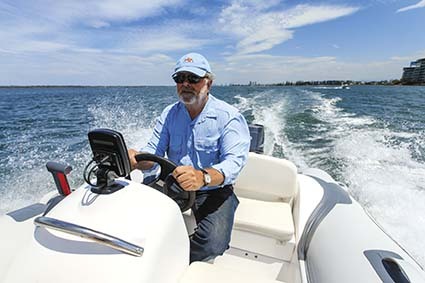 The 3.8m retails at $18,200 with the sounder and the 4.3m starts at $24,900 or $26,500 as tested with a bowrail and sounder-GPS. 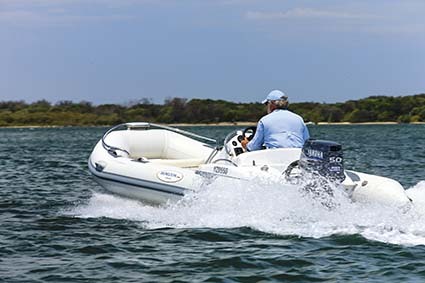 Both RIBs come with five-year hull and three-year tube warranties and as such are well priced, coming standard with a canvas boat cover, a waterproof repair kit and a high-volume foot pump for inflation.